Mandy has a penchant for visits to ancient monuments, having visited Machu Pichu and Angkor Wot in particular. I have an interest, but not as strong as her and I’d not been on these trips (preferring, in recent years, to do some diving instead). However, the one site we both wanted to see was Petra in Jordan. With the turbulent times in which we live, we decided that, with Jordan still a peaceful, stable country, now was the time to go. 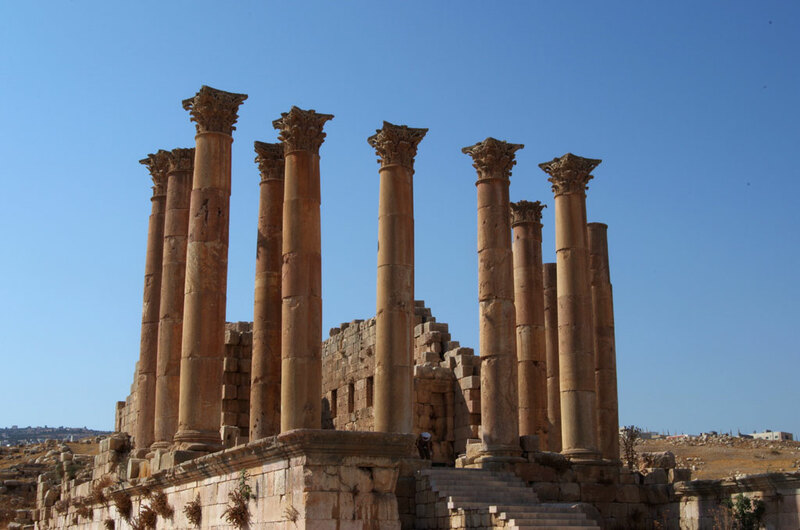 Initially, we thought of spending a week in Aqaba on the Red Sea and doing a day trip to Petra, but as I investigated, it became clear that there was more to Jordan than ‘just’ Petra. In the end, we opted to take a tour with On The Go Tours, who run guided trips to all sorts of places. 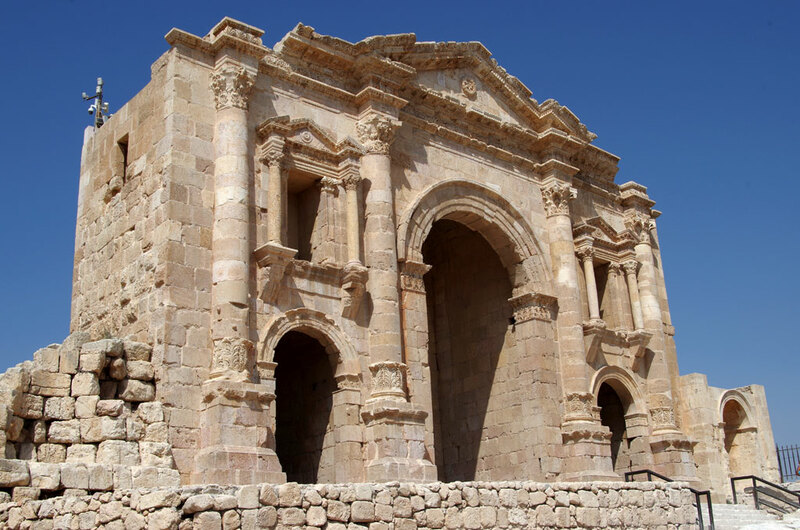 Booking with them was an easy and pleasant experience and we settled on the Totally Jordan tour with a 3 night add on in Aqaba at the end, to enable me to get a bit of warm, clear water diving in too! 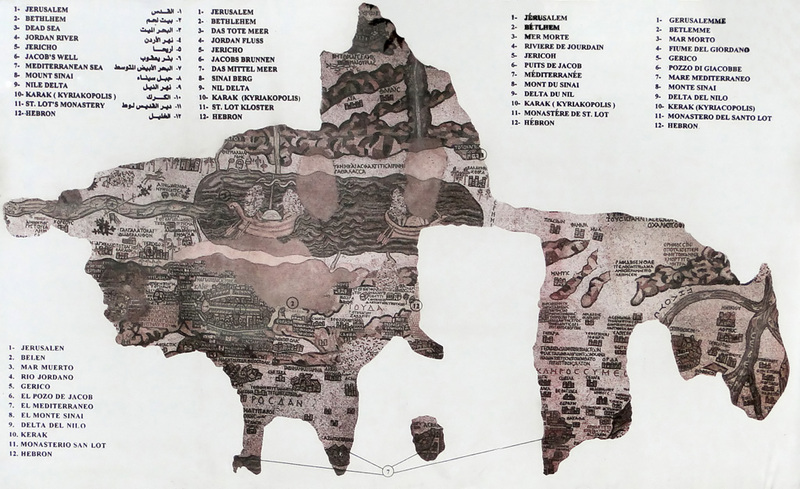 The tour didn’t include flights, so we booked an indirect flight to Amman, via Istanbul, on Turkish Airlines. The flight was delayed out of Gatwick, but that just meant less overnight hanging around in Turkey, so wasn’t really a problem and the flights were fine (Istanbul airport’s toilets were pretty rank overnight, but, oddly, much better on our daytime return - Maybe they had plumbing problems on the way out?). 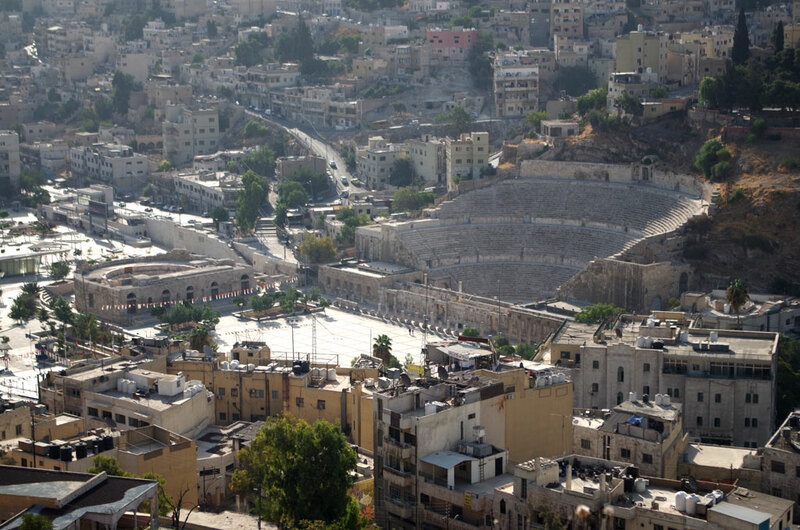 We arrived in Amman, pretty shattered, at around 5:45 and were greeted by a rep from OTG. We were quickly passed through immigration and luggage reclaim and into a taxi which took us to our Hotel. They apologised that our room wasn’t ready, but we really didn’t expect it to be at 6:30AM! We both fell asleep on sofas in the expansive reception and were then offered breakfast after which we were told our room was ready, still before 9AM! 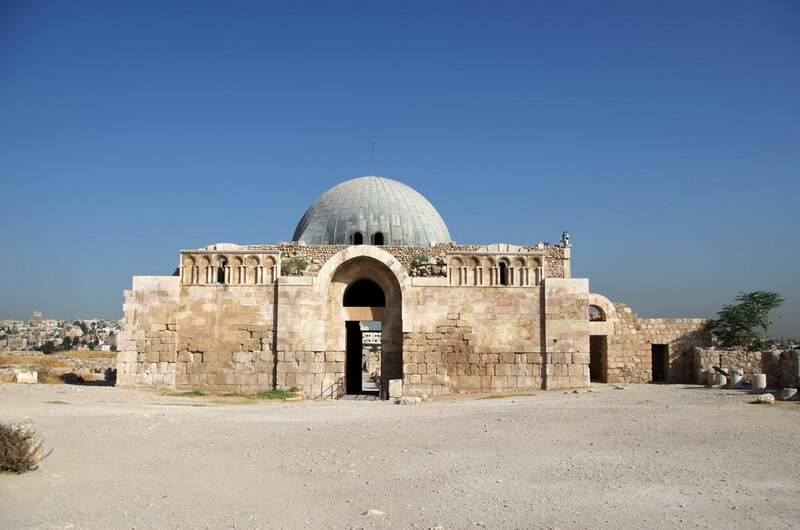 We unpacked and relaxed a bit and then decided to head downtown in the early afternoon to see what Amman had to offer. For about £2.50 we got a taxi who dropped us off in the middle of a bustling city. Eventually we found a Roman site, fenced off, but a worker inside beckoned to us to come in and look around. 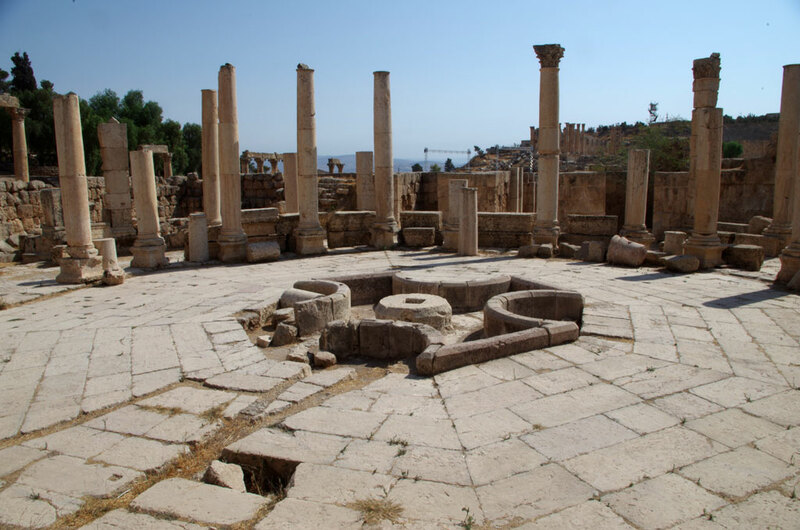 This was the Amman Nymphauem (town fountain) and is under excavation/renovation. 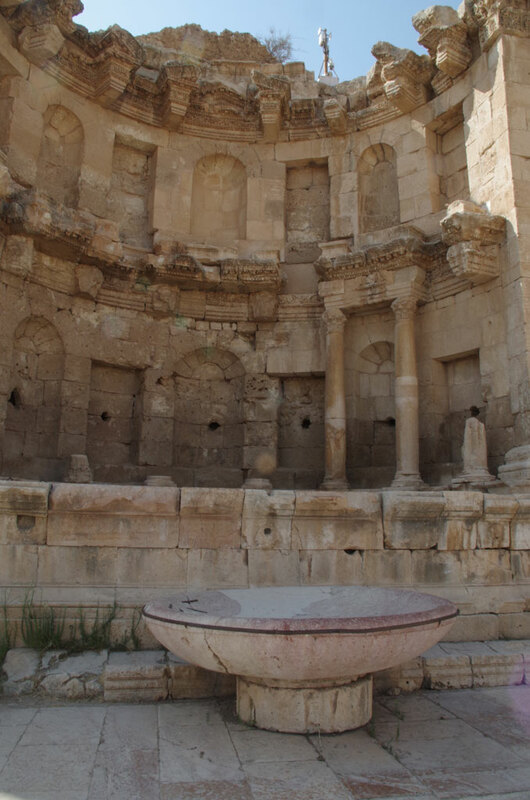 We walked on, changed some money, and grabbed an ice cream on the way to the Roman Theatre (On this holiday I discovered a semi-circular one is a Theatre, a full circle is an Amphitheatre!). As our agenda said we’d visit here later, we didn’t go in, but we did get a quick look in the small Theatre alongside the main one, thanks to the security man. Nearly everyone in Jordan seemed friendly and welcoming (In fact, the expression “Welcome in Jordan” was one we heard regularly from people at hotels and sites, but even people in the streets and once from a traffic policeman!). We hailed a taxi and for under £2 were returned to the hotel where we ate a meal in the rooftop restaurant before getting an early night after a long day and a night with little sleep before that. Our first day on the tour was supposed to start with breakfast with our guide at 7:30, but there was some confusion (perhaps not on our part) and it seemed others were meeting in reception ready to go! 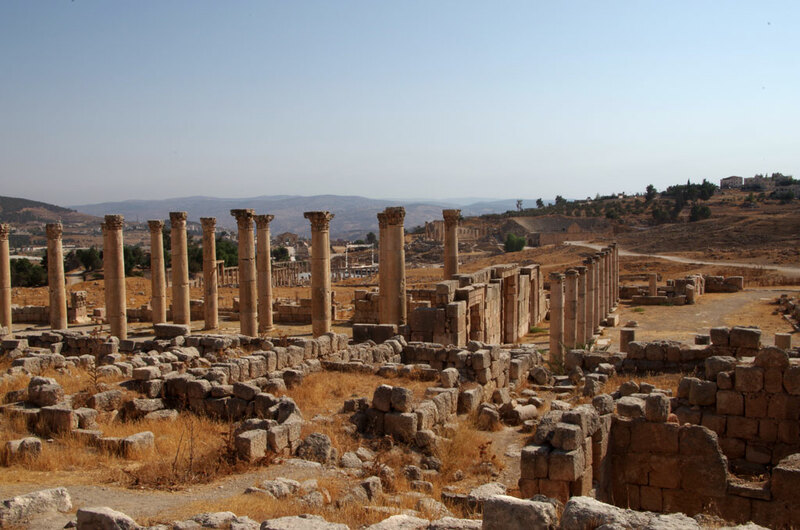 9 of us (Us, Lorraine - a former Mancunian from Canada, Louis and Nadia - lawyers from the US, Hilda - An Australian retiree, David and Mark and Vanessa - all Australians travelling) climbed aboard our bus and headed out towards Umm Qais, our first port of call. 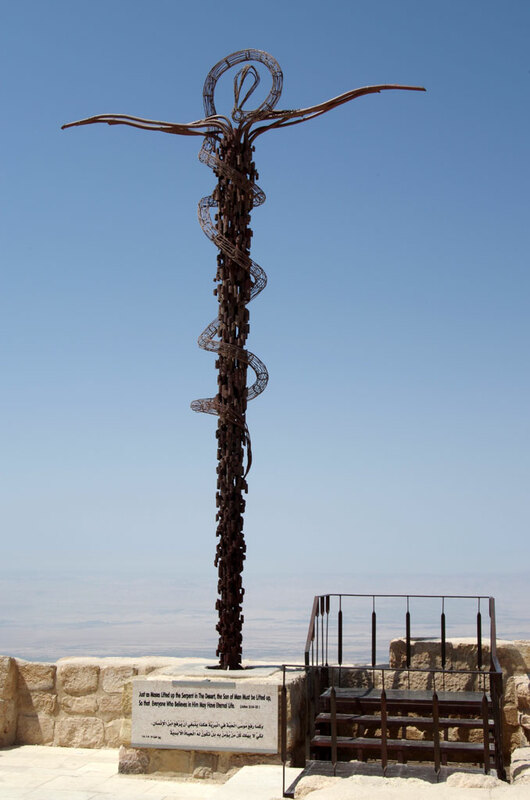 This is a large Greco/Roman site, on a hill overlooking the Jordan valley (and Israel beyond). 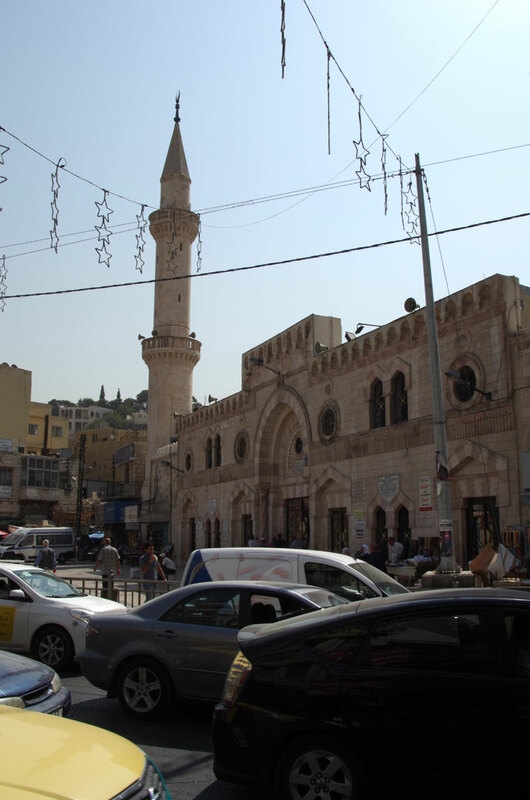 We explored the streets and towns for around an hour, including another Theatre, odd in that it faces West, suggesting events occurred here mainly in the evening or at night. The streets are pretty impressive here, some lined with tall columns. 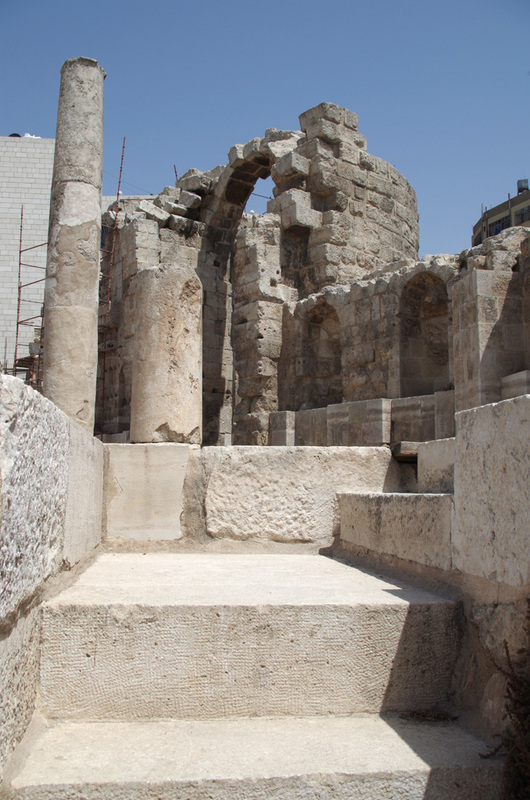 Umm Qais' Theatre is quite small and faces West, unusually. Back in the bus, we headed to Jerash, stopping for lunch in the town before moving onto the Gates of Jerash and the extensive Greco-Roman remains. 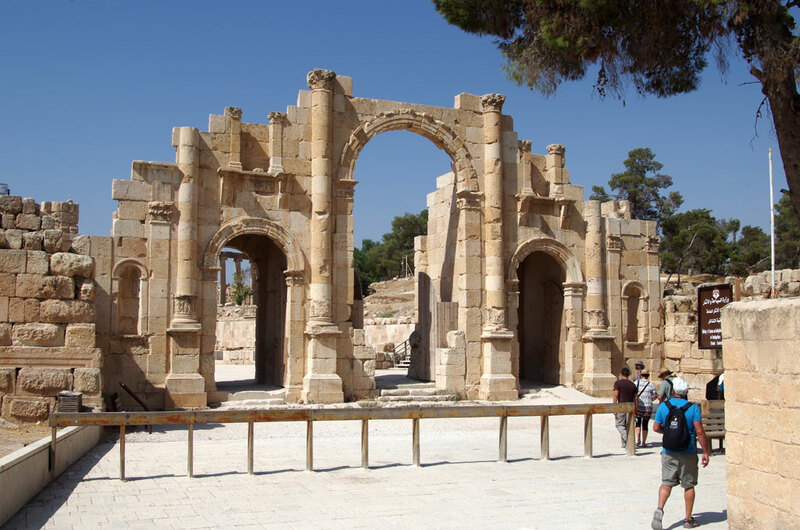 The dominant Hadrian’s Arch, as Ogler, our guide, pointed out, isn’t even in the main Jerash site, you walk a few hundred yards from there, past the impressive hippodrome complex, complete with ‘merchandise stands’, before you reach the city gates proper. 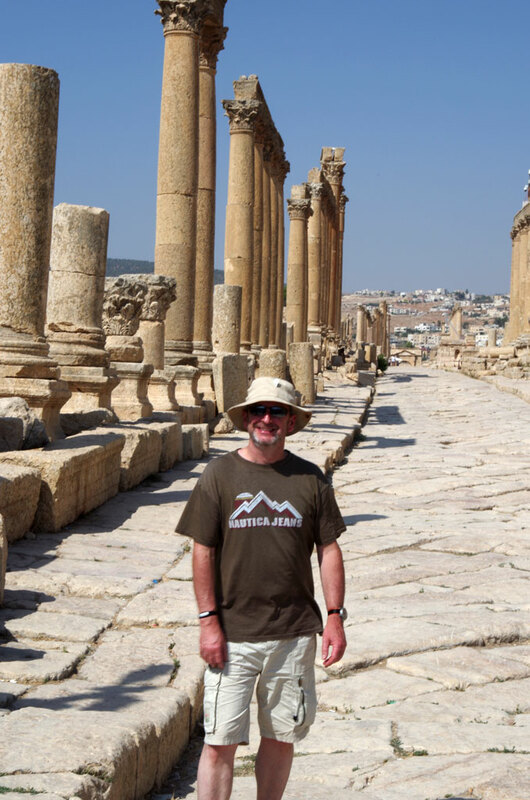 Me on the main street in Jerash - It was going to be a hot trip! 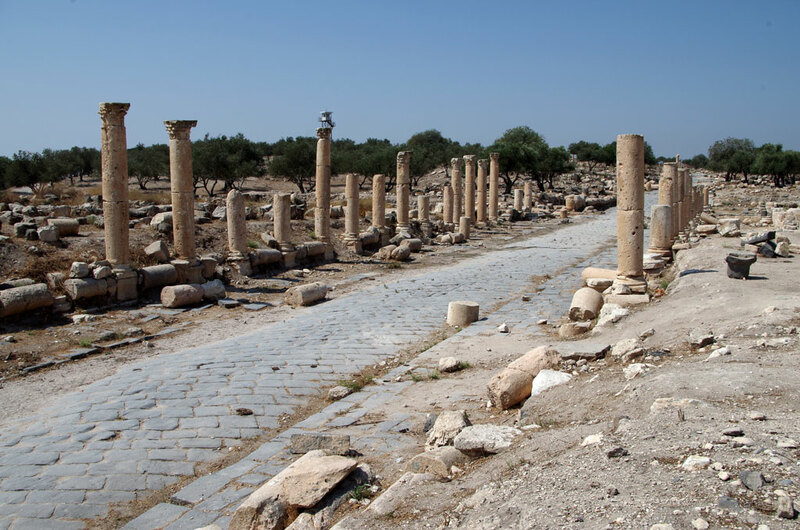 Through here you see the pillars arranged in an oval around the main plaza (being readied for an Andrea Bocelli performance when we were there, so still a place of gathering, and an indication of how normal life in Jordan is compared with many of its neignbours). Moving on down the main street, we passed below many pillars and impressive buildings including the town Nymphaeum and then up through the steps of the mighty temple to the highest point above the street. Fountain within a temple or house. From here we headed back around the higher ground, passing more temples and buildings before reaching the Theatre, where we were greeted by the sounds of bagpipes! Turns out they were invented in the middle east and are still played to this day (seems the Scots only invented deepfried Mars bars after all!). Mandy poses with the Bagpipe players! 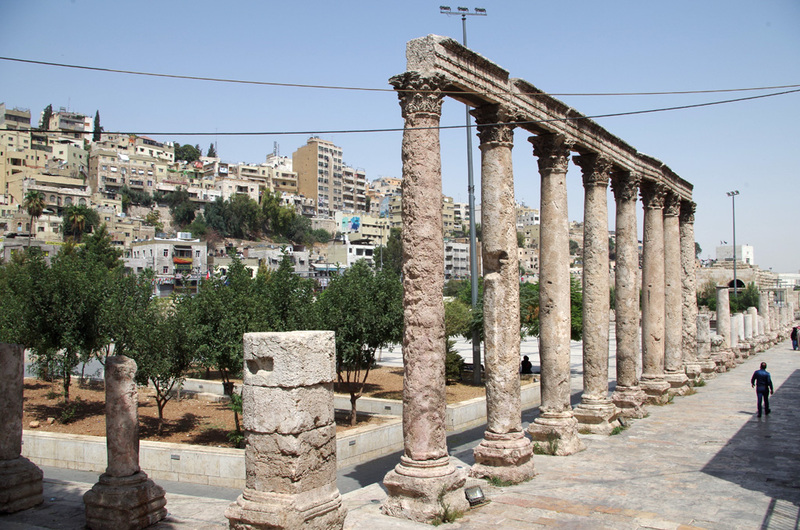 After a quick look at the ruins of the temple of Zeus (I think…), we headed back to the bus and to Amman for another night in the hotel, but not before we went out as a group for dinner to a restaurant in the thriving, modern part of Jordan. 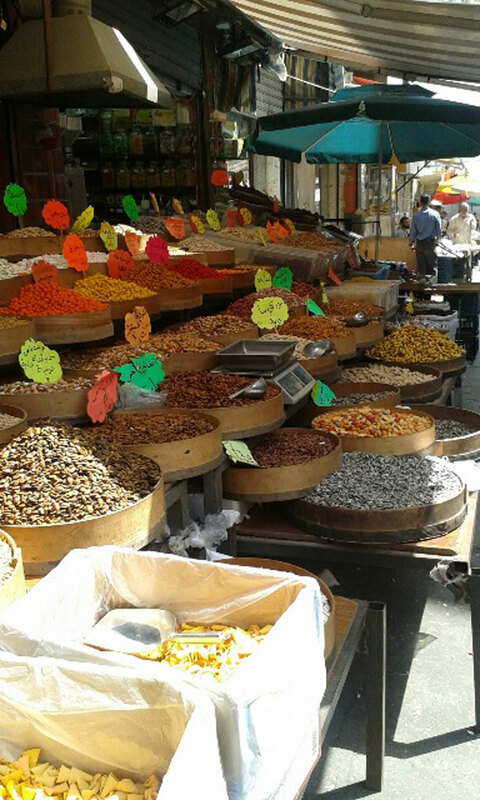 We ate a traditional Arab meal including (we were told) Goat’s testicles (They weren’t horrible, but I won’t go out of my way to have them again, imagine an offally cauliflower and you’re not far off!). We slept well again, but needed to be up for an early breakfast and check out before a full day ahead of us. I think it’s true to say everyone was looking forward to reaching Petra at the end of Monday, but we had plenty of interesting things to take in first. 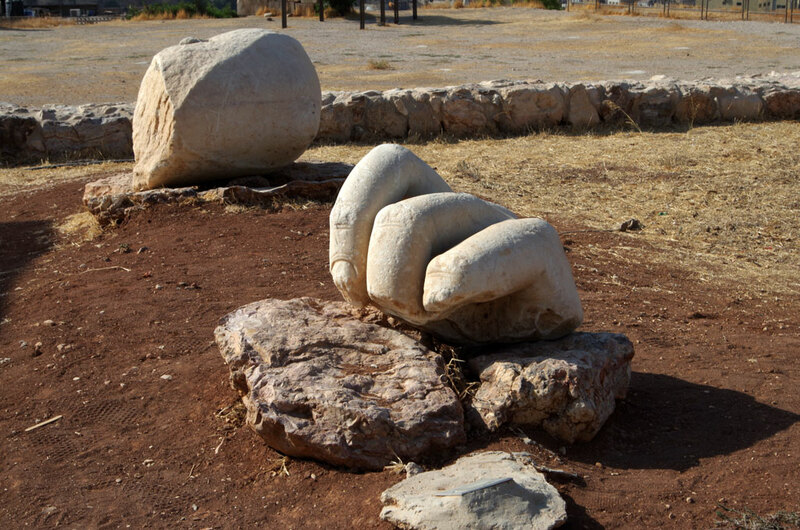 The day started with a trip to Amman’s Citadel (not a fort, but a hilltop city), which featured some impressive views of the city (including the Roman sites we’d seen on Saturday) and the remains of a mighty statue (with a hand the size of a washing machine!). 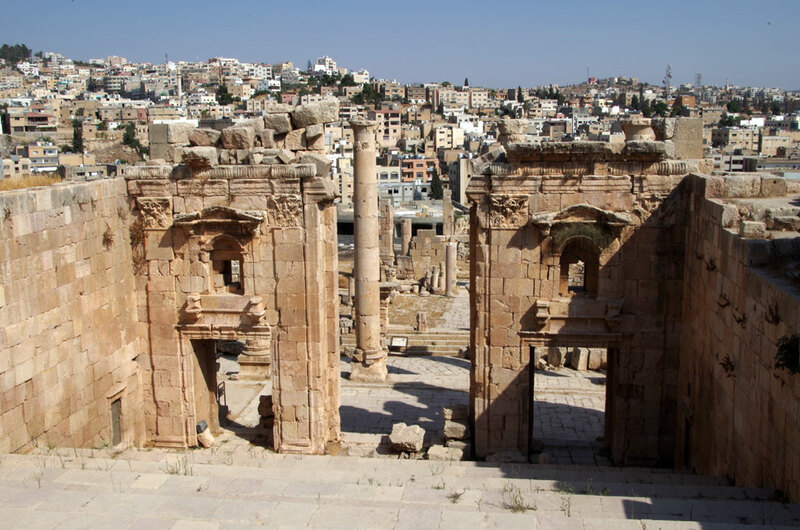 The gates to the Byzantine King’s palace in Amman have been restored and give a hint of the luxury which once topped this hill on this important stop on the Spice Route. Inside the small museum were some crude statues, believed to be the oldest human representations ever found! Interesting stuff! 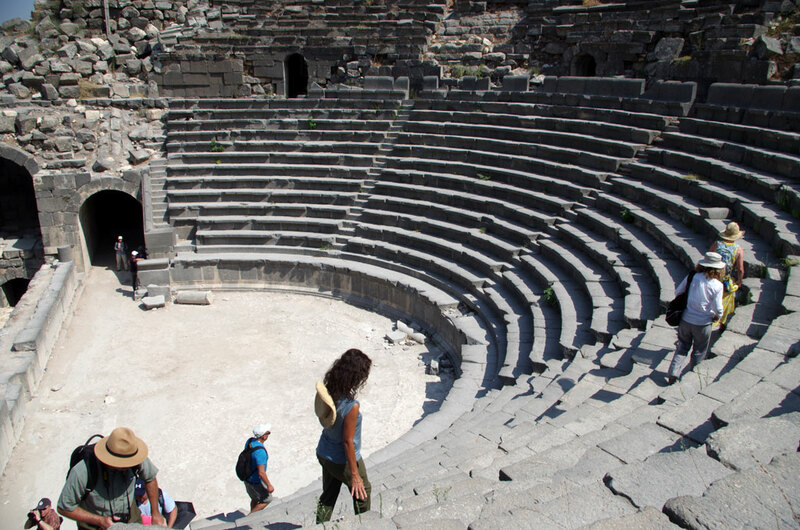 We drove down to the city and visited the Theatre, where we experienced the amazing acoustics these places possessed and marveled (and felt a bit giddy) at the height and steepness of the steps to the very top! 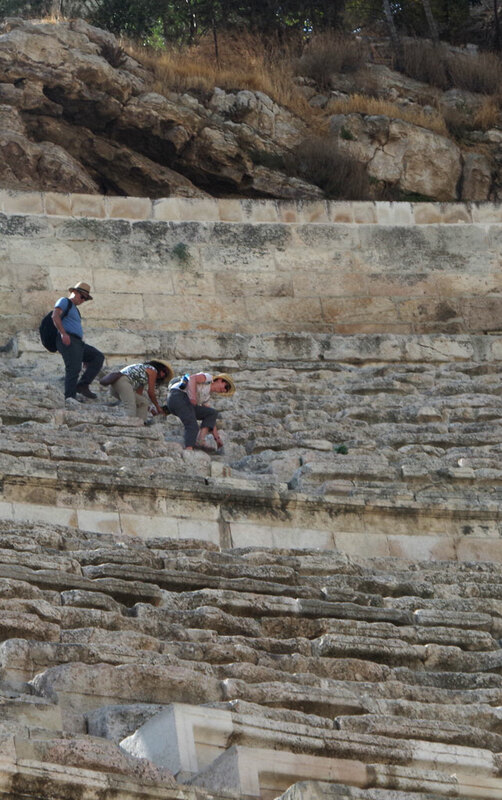 Top steps were frighteningly steep and narrow, especially on the way down! 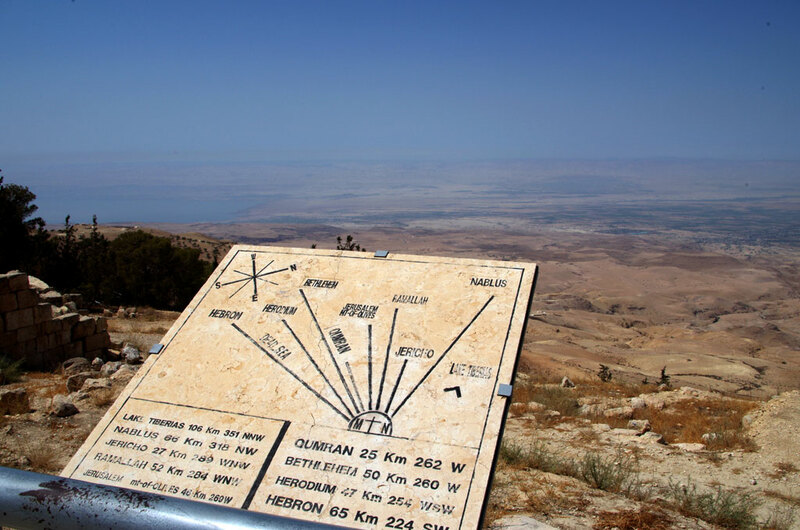 Back in the bus, we started the long and busy ride to Petra, with a stop at Mt Nebo, the point where Moses is purported to have seen the promised land for the first time. Inside a church here are some remarkable mosaic floors and we were treated to an impromptu choral performance by a group of visiting Japanese nuns! Monday was a busy day, but somehow didn’t feel hurried. 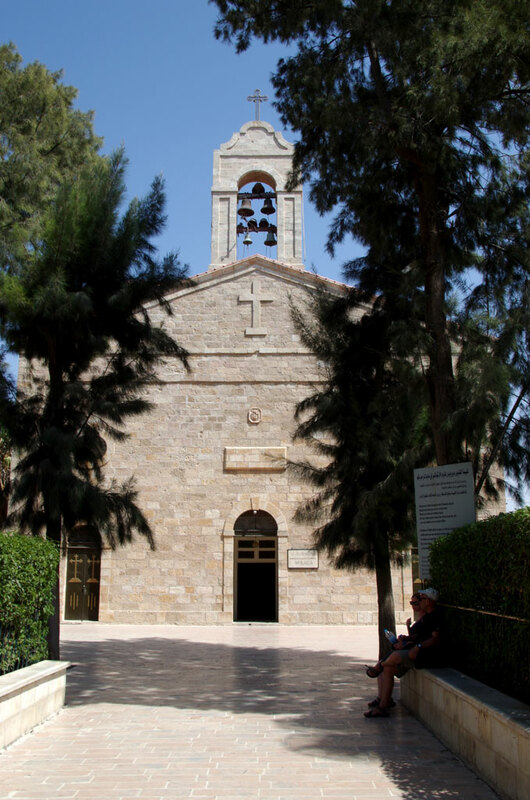 The next stop was Madaba, a primarily Christian town where we had lunch (including an 8% Petra beer - They do a 13% one too, but someone who bought a bottle said it was awful!) 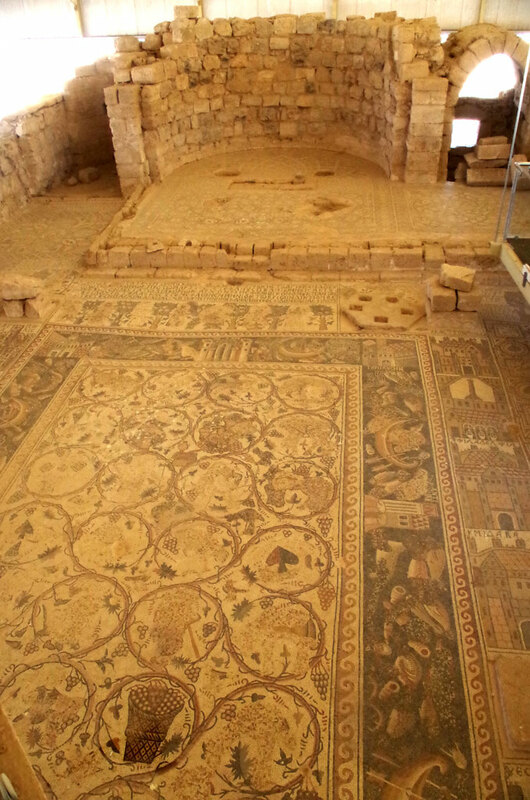 after visiting the Madaba Map which is part of a floor mosaic in the early Byzantine church of Saint George in the town. 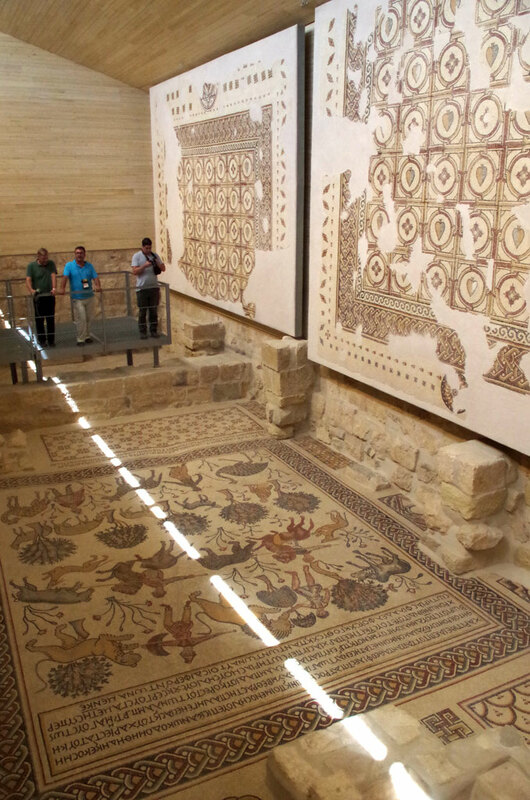 Another quick stop to see even more remarkable mosaics took place in Um ar-Rasas, not long before we joined the main road and headed down to Petra. Most of us had a little nap on the bus, but we arrived in Petra about 5:30, with the option (which most took) to venture into Petra at night. The walk down was very dark, illuminated only by candles in paper bags, which caught light from time to time! We reached the end of the gorge (famous from the Indiana Jones film), but the fascia of the Treasury was hard to make out in the dark. 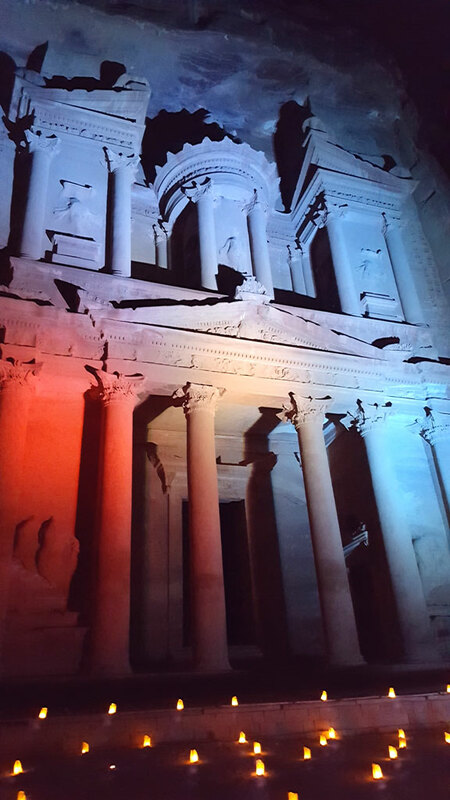 We sat and drank tea and listened to more Arabic music for about an hour before we were told to close our eyes and wish, when we opened them the Treasury was illuminated in a multi-coloured light show for about 15 minutes. Finally! The Treasury is illuminated in a light show!